*This Tart Cherry Chestnut Stuffed Turkey Roulade is sponsored by the Cherry Marketing Institute. Have any of you ever attended or hosted a Friendsgiving? It’s been on my “I wanna do that!” list for years and this year I got to do it twice! Once last week with some of my closest friends from the gym and today, virtually, with some of my blogging faves as we share a whole Thanksgiving spread focused on one of my favorite holiday ingredients, tart cherries. 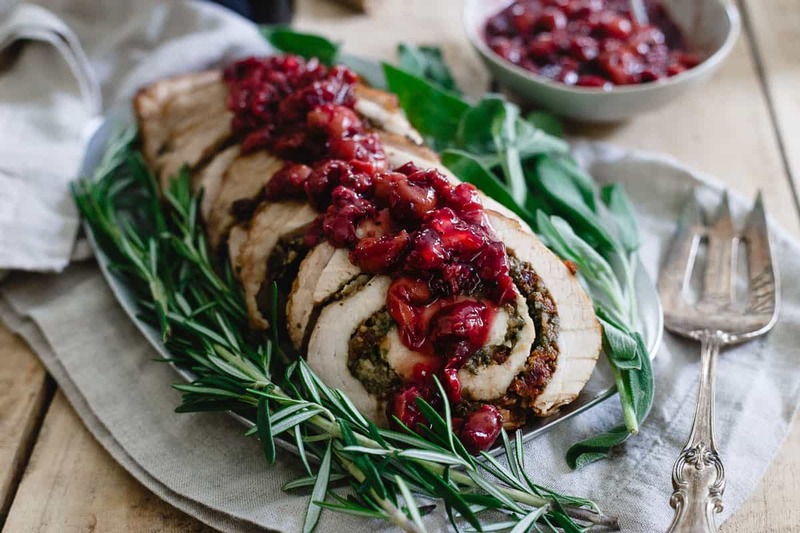 This turkey roulade is stuffed with Montmorency tart cherries, chestnuts and herbs. It’s topped with a red wine soaked cherry sauce and makes for a beautiful (and easy!) holiday dish. Last time I hosted Thanksgiving was in 2010. I had my entire family over, excited to finally get some use out of that fine china and silver my mom insisted I register for when we got married and have everyone in our at the time, relatively new house. I prepped for days, and we were so on top of our hosting game that Ulysses even had time that morning to go into the garage and tinker with the ATV he had at the time while I dealt with getting the turkey in the oven. Next thing I know, he’s inside the house saying his shoulder hurts but has no idea from what. I brush it off and continue with the meal prep. Fast forward a few hours later to dinner and he’s in so much pain he’s upstairs splayed out on our bed with his arms above his head in the only position that doesn’t send excruciating pain from his shoulder down his arm, misses dinner (which also meant I cooked, served and cleaned up the entire holiday meal without his help), we end up in the ER on Thanksgiving night and then driving around afterwards searching for the one and only open pharmacy to fill pain killer prescriptions. Fun times. But not really. His injury was incredibly bizarre, we still don’t know what caused it but it was a very badly pinched nerve that literally deteriorated his entire bicep and tricep in one arm before it got better (after many months and lots and lots of PT). We now call it his “little arm” and I can’t look at it without thinking about that miserable Thanksgiving. Now you know why it’s taken me 7 years to want to host it again. It was an incredibly fun time though. I made the turkey (a 20 pounder! ), my mom’s stuffing recipe (which I really need to put on the blog because it’s so good! ), a variation of these green beans with bacon and goat cheese because they’re always a hit and some cornbread muffins for good measure. Everyone else contributed a side dish, an appetizer or dessert (omg, we had the BEST pies) and of course, some alcohol and we feasted. A late night game of Cards Against Humanity finished things off and totally sold me on the idea of an annual Friendsgiving. Maybe just not at my house next year. So this virtual Friendsgiving thing? Yeah, I can get behind this. When a tart cherry chestnut stuffed turkey roulade is involved and there’s no cleaning up after 22 people, that’s my kind of holiday. I’ve been partnering with the Cherry Marketing Institute for a few years now so I’m sure you guys know a good amount about these gorgeous little superfruits and how their benefits go a lot further than a tasty pie filling. Montmorency tart cherries have an array of health benefits from helping to reduce inflammation, aiding in sleep and reducing the risk of arthritis. They’re also just superbly festive in color so it’s basically a win/win. I love the heritage piece of their story though the most this time of year. Montmorency tart cherries are grown on small U.S. family orchards. Using them in our holiday recipes helps support local agriculture and preserve old family farms. Something about that just seems perfectly in the spirit of Thanksgiving, doesn’t it? 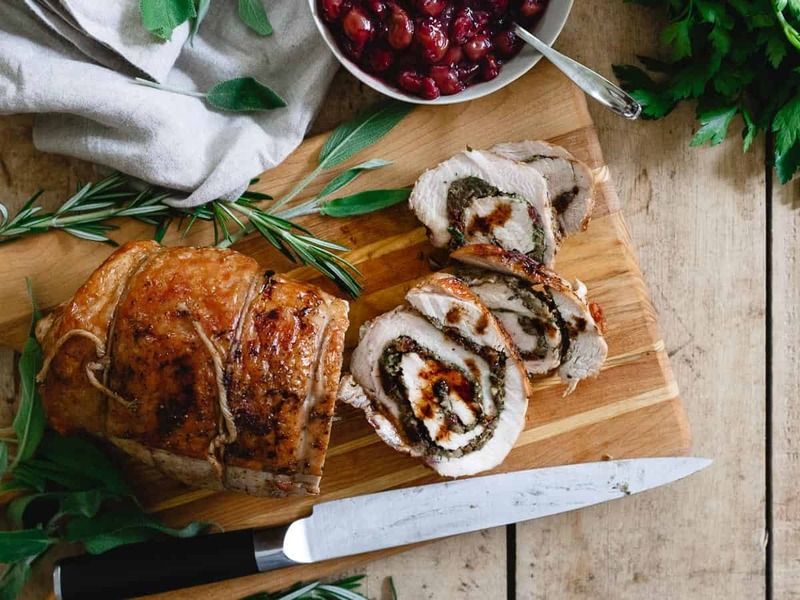 If you’re hosting the holiday and looking for something a little easier or more appropriate for a smaller gathering than roasting a whole bird, this tart cherry chestnut stuffed turkey roulade is your answer. Not to mention, it won’t take up oven space for 3+ hours and if you’re like me without double ovens in your kitchen, you know how important that is on this holiday in particular! The tart yet slightly sweet flavor of the cherries is combined with hearty chestnuts and plenty of fresh herbs to make a delicious stuffing. Each bite of moist turkey breast is accompanied by a bit of the flavorful stuffing. The red wine soaked tart cherry sauce takes the dish over the top in flavor and makes it a stunning centerpiece to any holiday table spread. Head over to see the full Friendsgiving menu from a tart cherry apple cider to start through to a tart cherry amaretto pie for dessert, all focused around the wonderful Montmorency tart cherry! 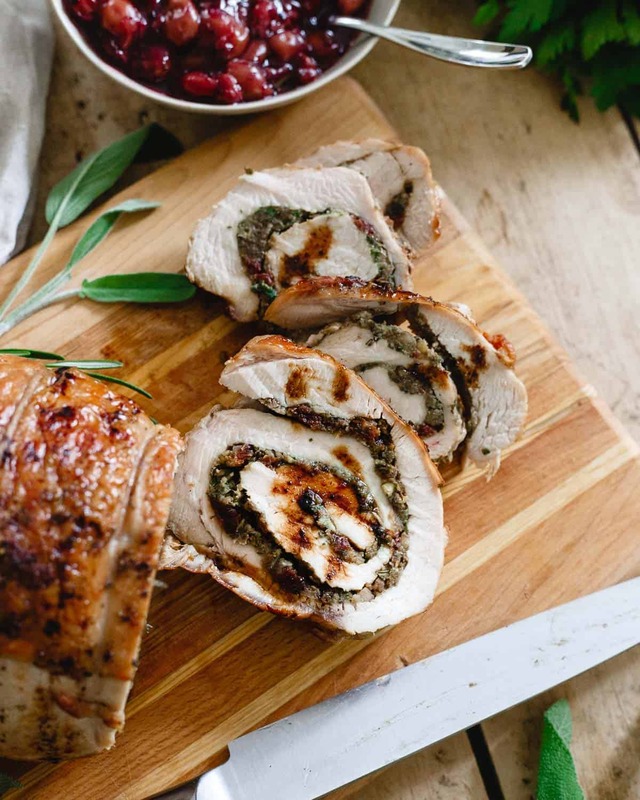 Love this Cherry Chestnut Stuffed Turkey Roulade recipe? More Thanksgiving recipe ideas using tart cherries – sweet and salty green bean cherry salad, tart cherry glazed turkey, tart cherry red wine spritzer, butternut squash goat cheese dip with tart cherry compote. This turkey roulade is stuffed with tart cherries, chestnuts and herbs. It's topped with a red wine soaked cherry sauce and makes a beautiful holiday dish. Preheat oven to 375°F convection roast (or 400°F regular bake). 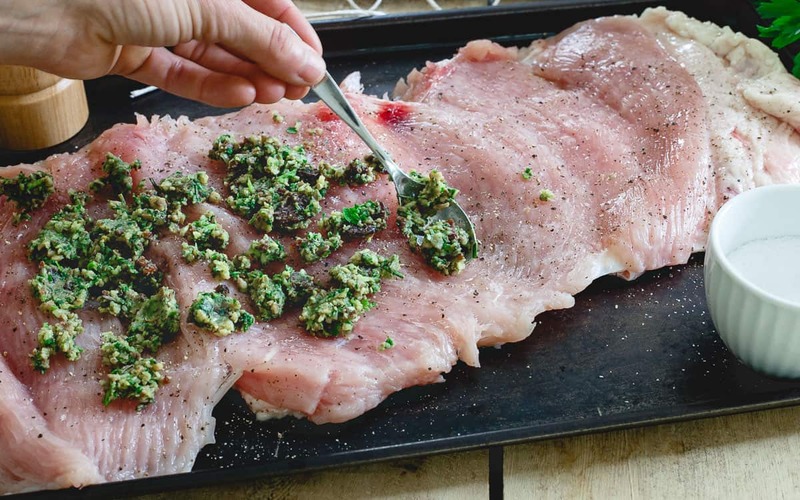 Lay the turkey breast out on a large cutting board. Season liberally with salt and pepper. Place the tart cherries, chestnuts, onion garlic, parsley, sage and rosemary in a food processor and process until finely chopped (mixture should be similar to a pesto-like consistency before you add olive oil). Spread the mixture on top of the turkey leaving a small space without filling around the edges of the turkey. Carefully roll the turkey breast into a log and secure with kitchen twine in 3-4 spots. Place the olive oil in a large cast iron skillet over medium-high heat on the stove-top. Once hot, place the rolled turkey breast seam side down in the skillet and cook until browned. Flip and brown on the remaining sides. Once browned, transfer the skillet to the oven and cook for about 40-45 minutes or until the internal temperature reaches 165°F. 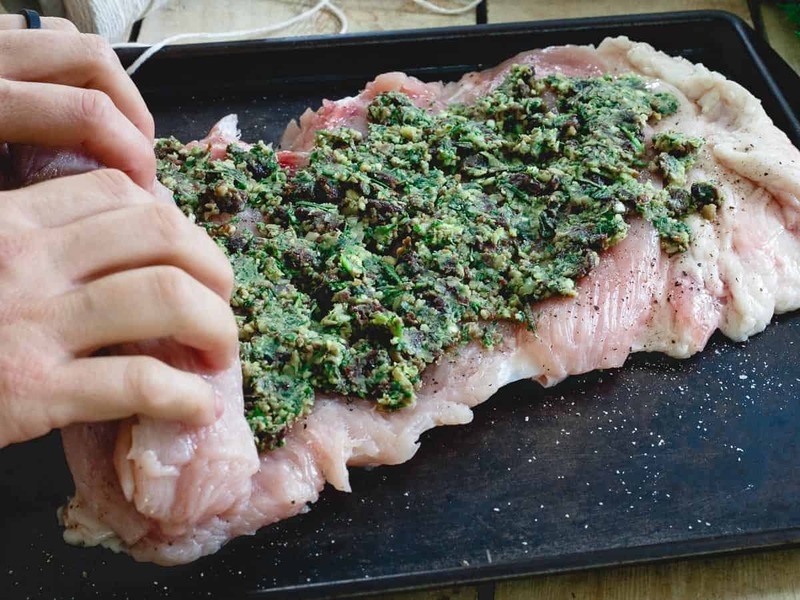 Remove from the oven, cover with foil and let rest for at least 10 minutes before slicing and serving. 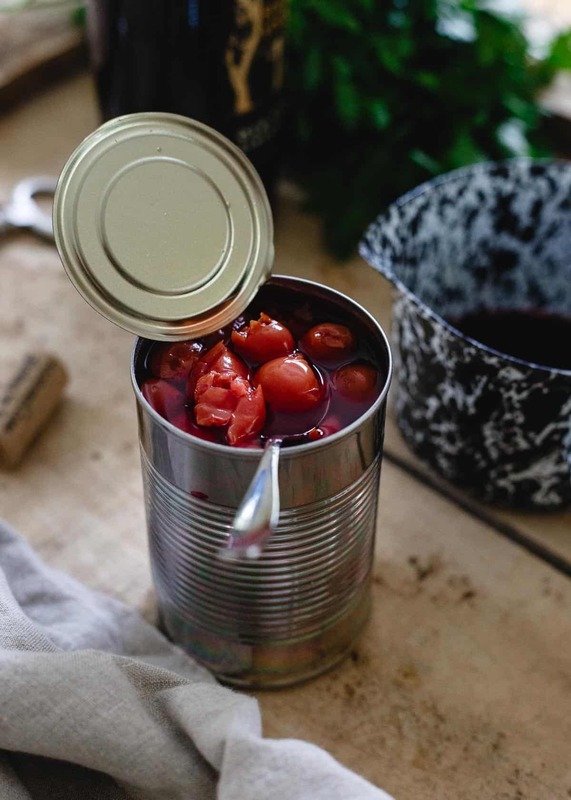 Combine the drained tart cherries, red wine, herbs, salt and pepper in a small sauce pot over medium-high heat. *Ask your butcher to butterfly the turkey breast for you. **Find roasted and shelled chestnuts usually by the nuts/raisins section of your grocery store or sometimes in the aisle by the register in plastic pouches. ***You can add a cornstarch slurry to the mixture at the end right before removing it from the heat if you'd like it a bit more "saucy" (1 tablespoon cornstarch + 1 tablespoon cold water - stir to dissolve then add to pot). What a gorgeous roulade! A fabulous alternative to a roast turkey—and that cherry topping looks amazing, too. Hope you’ll never have a Thanksgiving like that first one years ago!!! I love the idea of a turkey roulade!! Sometimes making an entire turkey can be daunting, but this recipe with the cherries and chestnuts, amazing! This is SUCH a pretty dish! The use of cherries with chestnuts is SUPER brilliant – can’t wait to try as I love me some cherries! Woah Gina this is gorgeous!I love those flavors together so much! 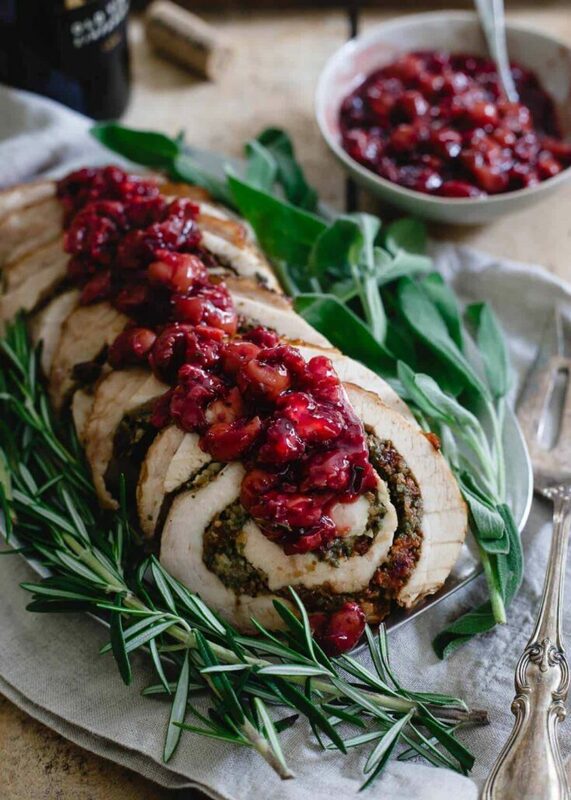 Thanks so much – I love the idea of a turkey roulade! !